Use 2273 points to purchase this product! High Quality Super High Strength (250,000IU) Serrapeptase enteric coated tablets. The tablet coating prevents the enzyme within the tablet from being harmed by stomach acids. 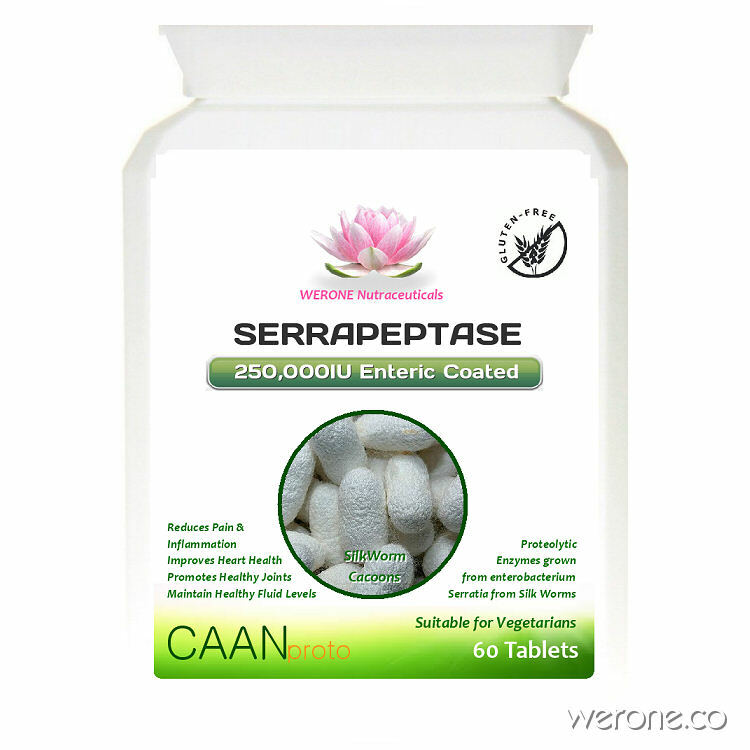 Each Serrapeptase tablet contains the Serratiopeptidase Enzyme preparation providing 250,000IU of activity. This powerful enzyme helps support and maintain healthy fluid levels in the body, healthy joints, muscles and helps support and maintain cardiovascular health. Serrapeptase has been used as a nutritional supplement in Europe and Asia for nearly three decades. Serrapeptase, also known as Serratiopeptidase is an enzyme isolated from a bacteria called enterobacterium Serratia sp. E-15 and now known as Serratia E15. This enzyme is produced in the intestine of the silkworm. Silkworms go through a transformational process within a cocoon that turns them into moths. It is this specific enzyme that is used by the silkworm to dissolve the cocoon and re-emerge as a moth. Serratiopeptidase has powerful anti-inflammatory properties and is particularly useful for post-traumatic swelling, fibrocystic breast disease and bronchitis. It is able to digest dead tissue, blood clots, cysts, and arterial plaques. Clinical studies have shown it to be effective at reducing swelling and oedema and metabolising scar tissue in the body. Take one to two tablets a day on an empty stomach with a full glass of water, 30 minutes before food or 2 hours after.